Buy Meat Mates dog food online at Pet Circle and enjoy the convenience of delivery straight to your door, always at the best price – or we'll beat it. 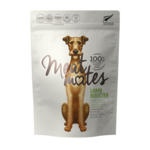 Made in New Zealand from single source free-range meat and cage-free chicken, Meat Mates are the ideal way to bump up the nutritional content of your dog's usual meals. 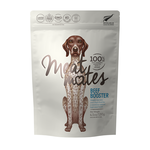 Containing sustainably farmed meat, a dash of Hoki oil and rosemary extract, Meat Mates' meal toppers promote an antioxidant boost as well as a shiny coat as well as a nutritiously natural protein boost. 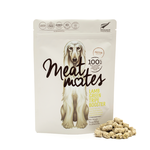 Every bowl of your dog's food can be improved by adding Meat Mates' freeze-dried meats – making them perfect for picky eaters or dogs who need a little extra nutrition. Starting off as frozen raw meat, moisture is then extracted without heat or cooking, leaving behind a raw product that still retains all of its nutritional benefits. Free from grains, fad fillers and GMO ingredients, Meat Mates contain nothing but 100% goodness and can even be used as tempting treats.